Allwinner A80 based tablets such as Onda V989, and development boards such as A80 OptimusBoard started to ship one to two months ago, but there was absolutly no news about Android mini PCs / media player based on the latest Allwinner processor. 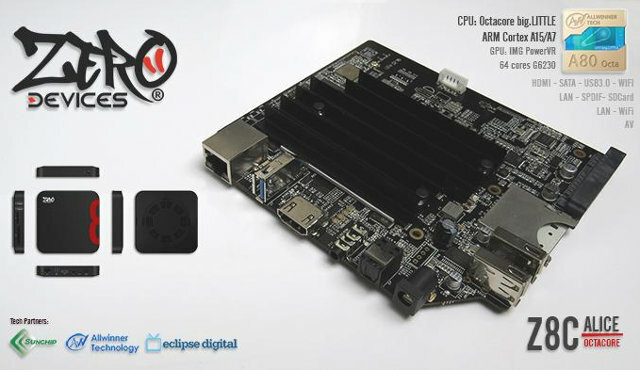 This is about to change as ZeroDevices twitted about their Z8C Alice TV Box, apparently designed by Sunchip, and in collaboration with a UK based digital signage company called Eclipse Digital Media. There’s a header at the back of the picture that might be used to connect a small board with for power button, and/or LEDs (TBC). The four through holes very close to the power barrel and S/PDIF connector is most likely the UART pins. Zero Devices also started a thread on Freaktab, where they posted a picture with showing the device get 54,253 points in Antutu. For some reasons, Antutu scores reported with devices and boards powered by Allwinner A80 have varied a lot from just a little over 30,000 to 65,000 depending on the firmware used, so any score should be taken with a grain of salt. Pricing and availability are unknown at this stage. The small header near the S/PDIF connector is the IR, it’s a 2.5mm jack to which you’d need to connect an IR receiver such as this http://www.amazon.com/Monoprice-5-Feet-Extender-Receiver-108060/dp/B005E2XLNM/ for example (althoug the connector is the wrong size). CNX earlier reported some A80 issues (freezing, USB 3.0 speed), assume Zerodevices has solve these? There’s an IR header (3-pin not soldered) close to the white header on the top in the picture. I understand the 2.5 (or 3.5? )mm jack on the left of the S/PDIF connector should be for AV output, and the 4-pin header (not soldered) might be for UART. I’ve contacted Allwinner, and they can not reproduce the issues on their side. They told me it could be the power supply. But the 5V/3A provided with the board, as as well as an another one can’t sustain the load. In case it was temperature related, I’ve now added a largish heatsink + an external fan, and the problem still occurs when running multi-core benchmarks. So either my board has issue, or I need a 5V/4A power supply. You are right in the article, the white connector is used to connect a small board for IR and led light. Simplest power fix that can extend beyond singular hack is to get a big lab supply, and use a hacked USB hub as a “extension cord”, personally used one of those el-cheapo 7-port hubs with individual switches (as sticks cannot be powered up without removing the power first), only mod being changing the individual port fuses with 4A ones (maybe a 6A would suit these RK3288/A80/M802 ones better). 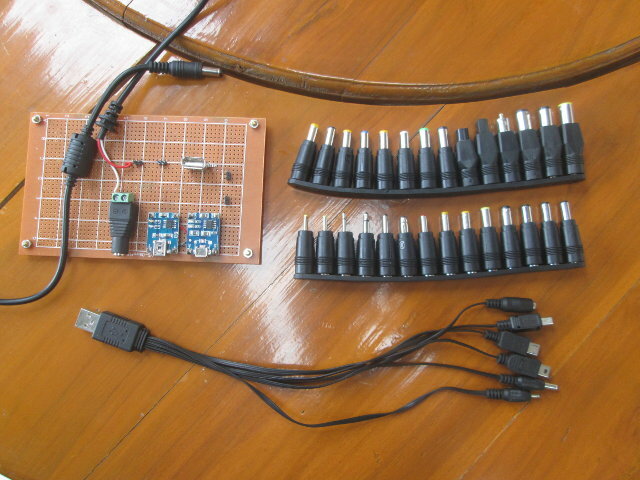 The other advantage would be that it also provides an easy way to measure power consumption. But I’m not sure if cheap models work as advertised. It will be available next month for $80 (Factory price) according to the interview. @cnxsoft That’s good to know! 20Watt power supply sounds logic, but not USB common. Those cheap adjustable PSUs are terrible, they are not even close to stable, or EMI, free. A proper SMPS fixed voltage supplys are much better (and >90% efficient while at it), some have currency/power display too, but personally my default to go mfg is MeanWell, that does those SMPS supplys where you wire it up yourself… to a USB hub with hacked 5VDC cable, those cost next to nothing. As simple shunt + voltage meter can act for currency/power measurement. Tom how allwinner will manage to solve the availability of open source drivers for PowerVR GC6230 ? As long as this issue is not solved im afraid that this amazing board is waste of time and good components. Finally it is probably the Z6C will be launched soon but after some deep changes… news soon!